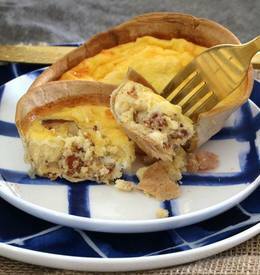 Bacon & egg tortilla shell quiche! If you thought making individual quiches the traditional way was easy… wait until you check out these babies!!!! SOOOO simple! They take just 5 minutes to prepare and are pretty much the perfect little snack! Have a peak at my recipe video to see how quick they are…oh, and don't forget, Bacon!